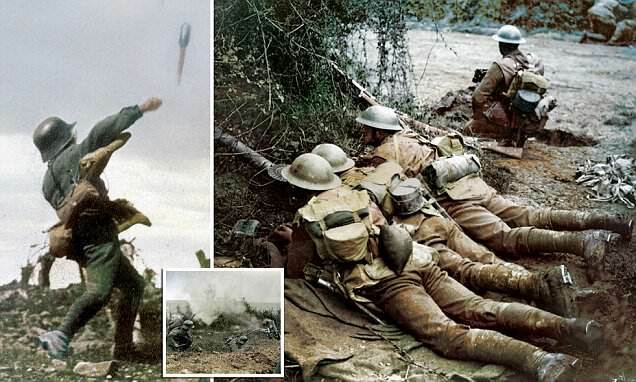 Fascinating new pictures show the horrific realities of World War One - in colour. Jon Wilkinson's new book, 'The Great War Illustrated in Colour', shows readers the heart-breaking scenes of warfare in impressive detail. Carefully colourised images reveal the intimidating sights of the main assault ships used by the Royal Navy, the bodies of soldiers strewn in perilous trenches and troops advancing through barbed wire to attack British forces. 'I hope to project to the readers what these soldiers would have seen with their own eyes' Mr Wilkinson explained. 'Adding colour takes the reader back to these places and gives them a sense of what it would have been like. The book highlights details of the disastrous naval Zeebrugge Raid of 1918 and show the intimidating sight of the main assaults used by the Royal Navy in the First World War, overseen by Vice Admiral Sir Roger Keyes, HMS Vindictive which was used to damage the stone Mole at Zeebrugge and sinking the smaller ships in the channels at Ostend. Another striking image from the book shows readers the deck of HMS Vindictive, with its specially constructed gangplanks which were used to lower the naval officers onto the Mole. Other shots capture an aerial view of the aftermath of the infamous Zeebrugge Raid on April 23, 1918 showing the British ships being hurried through the entrance of the canal.